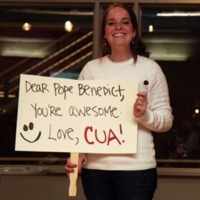 As the university awaited the arrival of Pope Benedict XVI, numerous events were organized by Campus Ministry for students relating to the papal visit. 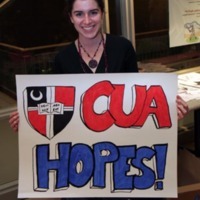 One of the first events was on March 1, when CUA students recited the rosary with the Holy Father and university students linked by satellite from Toledo, Spain; Aparecida, Brazil; Loja, Ecuador; Naples, Italy; Havana, Cuba; Mexico City, Mexico; Avignon, France; Bucharest, Romania; and Minsk, Belarus. CUA students introduced the fifth mystery of the rosary and led the recitation of the Hail Marys. 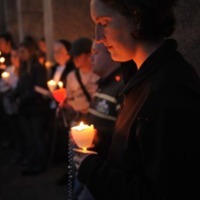 A candlelight rosary was organized on the evening of April 14. Students met at the Office of Campus Ministry and then proceeded outdoors, where they made five stops around campus for prayer and reflection in anticipation of the papal visit. 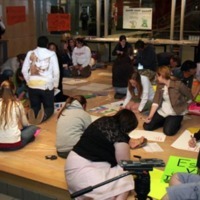 A banner and poster making party was organized in the Pryzbyla Center on the evening of April 15. 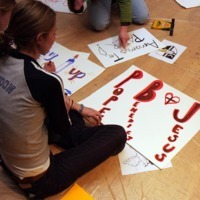 Students created personal posters and banners, displaying their faith and excitement. 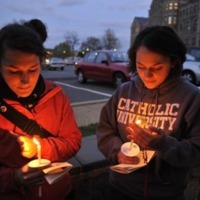 On the evening of April 16 a prayer vigil was organized at St. Vincent’s Chapel. Students participate in the Sixth European Day for University Students where they recited the rosary with the Holy Father via satellite from Vatican City.